The nearly 140-page bill incorporates a number of proposals, including a teacher pay raise, flexibility on opening charter schools and allowing teachers to bank their sick days for retirement. On Monday, West Virginia Senate Republicans moved to bypass review by the chamber’s finance committee — where they did not have the votes to advance the measure — and to take the bill directly to the floor, which may expedite the passage process. In doing so, they set up a direct challenge to the state’s teachers unions, which, like all teachers unions, oppose the creation of new charter schools. This may instigate another teacher walkout. Last February, teachers walked out over low pay and proposed changes to PEIA, which would have penalized teachers who didn’t meet certain benchmarks in a new wellness program. 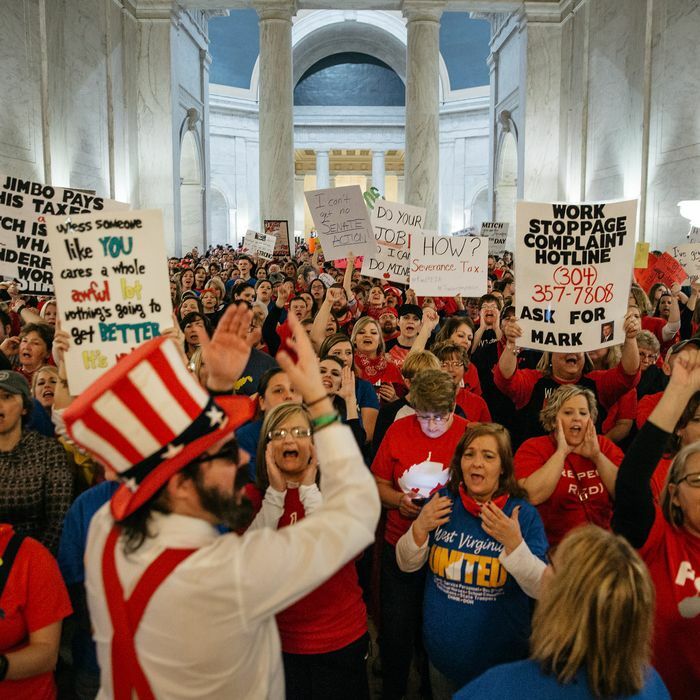 After a historic nine-day work stoppage, teachers believed they had a deal with Republican governor Jim Justice and a bipartisan conference committee in the legislature. In exchange for a 5 percent pay raise and the promise of PEIA reforms, teachers went back to class. Not only does Rucker’s omnibus proposal tie these pay raises and reforms to the creation of a charter-school system, the Register-Herald reports that it also contains a non-severability provision, which means that “if one part of the bill is overturned, the entire bill is invalidated.” In other words, if legislators want a clean bill with no charter provisions, they’ll have to scrap the whole thing and start at zero. Justice previously said he opposes charters, but in 2018, he was less than conciliatory toward striking teachers; it’s unclear if he would sign the bill in its current form. Asked about the possibility of another walkout will happen over the @wvsenate's omnibus education bill -- Dale Lee, president of @WVEAnews -- says anything "is on the table." If West Virginia teachers do walk out again, there’s a chance that they could set off another wave of labor actions. West Virginia isn’t the only state where legislators have introduced bills that may be viewed as retaliatory responses to walkouts. Republican legislators in Arizona have introduced bills that would allow the state to penalize or fire teachers who discuss political issues in the classroom. And in Oklahoma, a Republican legislator introduced a bill that would make it illegal for teachers to organize a walkout and would let the state revoke a teacher’s certification if they do so. In a statement to CNN, Alicia Priest, the president of the Oklahoma Education Association, referred to the bill as “retaliation” for last year’s walkout. Legislators in these red states seem to believe that they can prevent future walkouts by either penalizing teachers for political speech, or by forcing them to accept hated education reforms in exchange for higher pay. But these strategies may backfire. Virginia educators are rallying in Richmond over underfunded schools on Monday. Teachers in Oakland, California, are preparing for a strike, and in Chicago, the nation’s third charter-school strike is scheduled for February 5, unless educators and management can reach a deal. Teachers have political momentum — and that could spell trouble for right-wing legislators. This post has been updated to correct an error in the Beckley Herald-Register’s original report. The bill would legalize charters everywhere, not just in low-performing school districts.